The sun causes “solar interference” to all geostationary satellite signals. 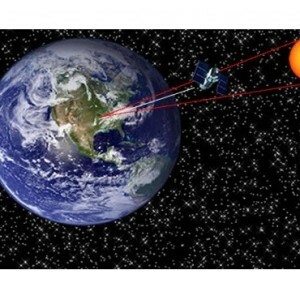 As the sun’s path across the sky gets lower each day, there are times when it is in a direct line behind a communication satellite that is sending signals to a receiving satellite antenna here on earth. When the antenna is looking into the sun, the interference from the sun overrides the signals from the satellite. This is when a sun outage occurs. Sun outages typically occur during the months of February/March and September/October, and can last as long as 15 minutes a day over a period of 15 days. The effects of a​ sun outage vary in degree from minimal to total outage throughout the 15 day period. Once it reaches its peak, the interference will gradually decrease becoming less noticeable each day after. Unfortunately, there is technically nothing we can do to prevent sun outages from occurring. Each satellite service that we receive signals from will experience this interference in the time frame mentioned above. At first, the effects of a sun outage are minimal, Gradually, it worsens to the point of total outage. Some channels that we receive digitally from the satellite will experience “macro-blocking” or “tiling” (as seen in the picture below) before and after the peak times.